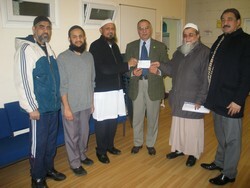 In a special occasion the Chairman of Noor Ul Islam Trust Leyton, Yusuf Hansa presented a cheque of £7,000 to the Community Liaison Officer of Muslim Aid, Mr M.W. Khokhar. This generous amount was given exclusively to help the people of Gaza who have lost their homes, possessions and livelihoods due to the conflict which began 20 days ago. The money will be used for Muslim Aid projects to provide food packages, blankets and medical supplies to some of the 1.5 million people who have been most affected. Aslam Hansa, Maulana Yousuf Patel, Reshad Joomun and Choudhry Mahmood Iqbal were also present. Mr Khokhar, on behalf of Muslim Aid, thanked the Chairman for his generous donation and ongoing kind cooperation with Muslim Aid.